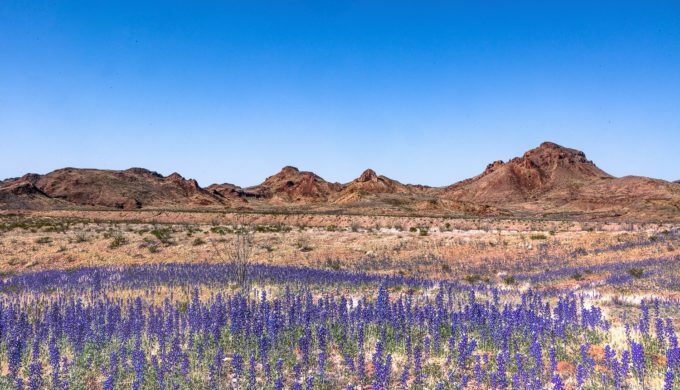 The Texas Big Bend is experiencing its largest bluebonnet bloom in decades. Local photographer Lee McMullen says he hasn’t seen a bloom like this in thirty years. 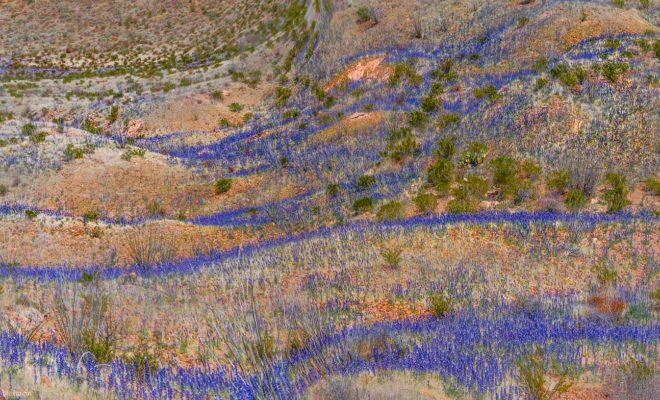 The bluffs and roadsides near and within Big Bend National Park are being overtaken by the strikingly beautiful Chisos bluebonnets. Big Bend National Park is the perfect place to take in the record-setting bloom sprinkled across the iconic scenery along the Rio Grande. Photo credit: Lee McMullen. 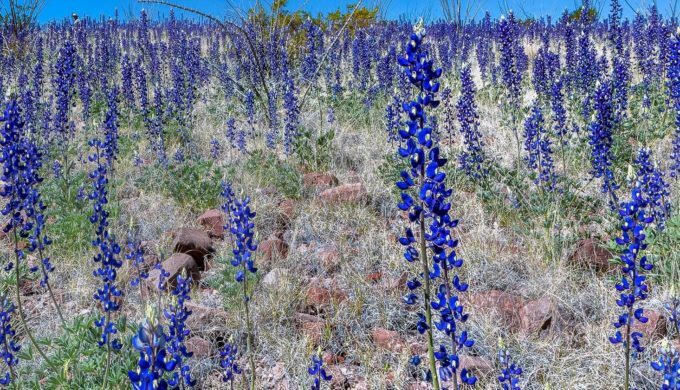 Lupinus havardii, more commonly referred to as the Chisos bluebonnets. Admission to Big Bend National Park is $30 for one private, non-commercial vehicle. The pass is valid for seven days. While in Big Bend National Park, make the drive from Mule Ears Viewpoint to the Castolon Visitor Center for the greatest bloom viewing. Take a drive along River Road for some more spectacular bluebonnet views. Even without the bluebonnets, Big Bend National Park is one of the most scenic areas of Texas. The incredible bloom this year is the icing on the cake. If you’re looking to avoid the entrance fees to Big Bend National Park, be sure to visit Big Bend Ranch State Park. The drive along Texas Highway 170 between Terlingua and Presidio follows the banks of the Rio Grande and winds through the rugged landscape of Big Bend Ranch State Park. This section of scenic highway is experiencing a particularly thick bloom. If you have the time, stop in Lajitas, Texas, to say hi to friendly goat Clay Henry, Junior, who is the residing mayor. 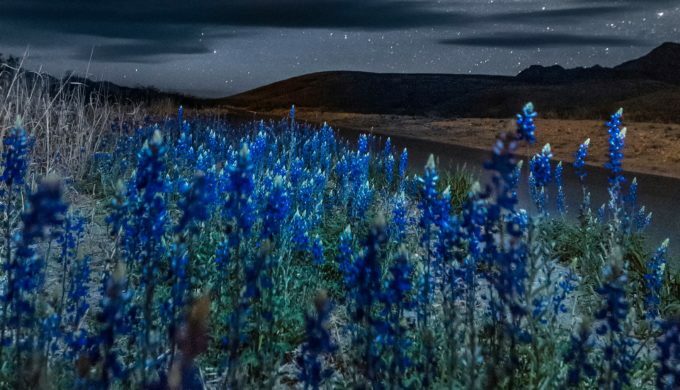 This record-setting bloom should last for another two to three weeks, so plan your trip to the Texas Big Bend soon. 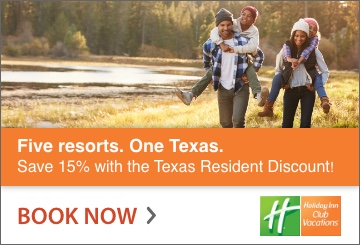 Plan accordingly for a visit to this remote section of Texas. Gas stations and stores are miles apart, and they close early. Lodging and dining can be found in Terlingua, near the Maverick Junction entrance to Big Bend National Park.